In the field of flexible work, Sara Sutton Fell’s influence is pervasive. She is the CEO and founder of FlexJobs, a career website specializing in job listings for flexible work. She’s also the founder of the online resource for remote teams and companies, Remote.co, and the national initiative supporting workplace flexibility, 1 Million for Work Flexibility. We spoke to Sara about the current state of flexible work and how employees and employers can work together to make workplaces flexible. OpenWork: How did you become involved in the field of flexible jobs and remote work? Sara Sutton Fell: It came out of my own experience. Back in 2006, I was seven months pregnant with my first son and found myself laid off from a VP-level position. I knew I wanted a job that was in line with my career and that also offered flexible options like telecommuting. I knew these jobs existed, but searching for them was incredibly time-consuming and frustrating with all the scams in the work-from-home market. I wished there was an easier way, a site where working mothers like me — as well as anyone who wanted work flexibility — could go to find legitimate, professional-level flexible jobs. OpenWork: How did Remote.co and 1Million For Work Flexibility come about? 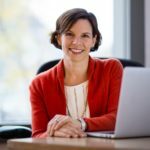 Sutton Fell: At FlexJobs, we heard from professionals every day who used our service to bring more balance to their lives, and I wanted to encourage even more companies, organizations and agencies to adopt flexible work options. There wasn’t one voice that was bringing together all stakeholders to champion flexible work. That’s why I founded 1 Million for Work Flexibility. I view it as our advocacy arm. FlexJobs is an entirely remote company, and most of what we’ve done to create a healthy culture and build a successful business in a virtual environment has been based on our own instincts. It had crossed my mind more than once that it would be great to have a way to learn from and share insights with other companies embracing remote work as a core part of their business strategy. So, in 2015, I created Remote.co as a one-stop resource for companies that see remote work as an opportunity for their businesses, their workers, their communities and the environment. It became clear that a larger conversation was needed, and that’s why we created the TRaD* Works Forum (which stands for telecommuting, remote and distributed) in 2016. It’s a community event for those keenly interested in learning how they can advance their organization’s telecommuting, remote and distributed work efforts. OpenWork: You just wrapped up the first TRaD Works Forum event. What were the major takeaways? Sutton Fell: One of the biggest things that can use improvement across the board is tracking the ROI of remote and flexible work programs. Only about 3% of companies measure things like productivity, performance and engagement to figure out the real results and performance of their flex programs. Imagine how powerful a remote and flexible work program could be if its managers could harness the data to expand on what’s working and improve what isn’t! OpenWork: At OpenWork transparency and trust are two of the major pillars in our discussions about innovative, flexible workplaces. How can employees and employers foster transparency and trust? Sutton Fell: These really are two of the foundational pillars when it comes to successful flexible workplaces. One of the most important things when implementing a companywide flexible work policy is to make it transparent, and to make it clear who can participate. Each company needs to design a program that works best for their business objectives and teams. Not every type of flexibility is going to work for everyone. For example, our client services team members have set schedules because we need them to be available to current and potential customers during set hours, but our writing and research teams have very flexible hours because their work is primarily independent. The key to making sure employees don’t feel frustrated is to make sure everyone has some type of flex available to them. If your front-facing people can’t work from home because they need to be onsite to greet clients, perhaps they can have flexible hours. If your customer service team needs to be available during set hours, maybe they can work from home. OpenWork: How would you suggest a very traditional, 9-to-5, office-based company begin to move towards flexibility? Sutton Fell: The first step is to assess your goals, the needs and wants of workers, and what options will work best for everyone involved. What types of flexible work will integrate within our workplace culture and our worker’s needs? Which roles should be eligible for what types of flexibility? What training can we provide managers and workers? Answering these questions will help a business to craft a customized, effective flexible-work program that supports business goals, the bottom line, and the team. OpenWork: We often hear that many companies offer flexible policies, but they aren’t being actively used. What can those employers do to make flexibility programs successful? Sutton Fell: Situations like this are often the result of a lack of communication or trust between the people who run the flexible work programs (managers, HR, etc.) and the people who could potentially use them (employees). To encourage more people to use flexible work options, there needs to be a clear program in place, company-wide, for when and how employees are able to participate. This will encourage more people to take part, because they don’t need to worry that their manager will or won’t allow it. Along with this, managers need to be trained to successfully manage flexible workers. Managers need to focus more on the results people are getting. OpenWork: How would you suggest an employee approach management about flexibility? Sutton Fell: 1) Do your research. Find out who else on your team or in the company has flexible work options, how they got them, and how they do it. The more information you have, the clearer your own proposal will be. 2) Be honest with yourself. What type of flexible work situation will really work for you? What percentage of your role is conducive to the type and amount of flexibility you want? 3) Ask for a formal meeting, either with your manager, HR, or both, depending on who controls flexibility at the company. 4) Create a proposal to present at your meeting. The key is to build trust, so be well-prepared and clear in your goals. You’ll want to show that you’ve put concerted thought into this, show how this change will impact your performance and the company, and what it would look like in practice. 5) Suggest a trial run. Managers will often be hesitant to immediately agree to your proposal. If that’s the case, suggest a trial period of one or two months when you’ll be able to demonstrate how it works.